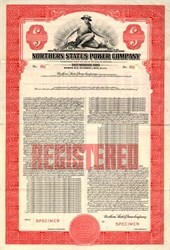 Beautifully engraved specimen certificate from Northern States Power Company dated 1947. This historic document was printed by Columbian Bank Note Company and has an ornate border around it with a vignette of Mercury sitting on a world globe. This item is over 60 years old. Xcel Energy, Inc. NYSE: XEL is a public utility company based in Minneapolis, Minnesota that provides services in the U.S. states of Colorado, Kansas, Michigan, Minnesota, New Mexico, North Dakota, Oklahoma, South Dakota, Texas, and Wisconsin. Primary services are electricity and natural gas. Subsidiaries include Northern States Power Co., Public Service Company of Colorado, Southwestern Public Service Co., and WestGas InterState, Inc. On January 21, 2005 Xcel Energy announced the completion of the sale of its Cheyenne (Wyoming) Light, Fuel & Power electricity and natural gas operations to South Dakota-based Black Hills Corporation. The company sponsors a sports arena, the Xcel Energy Center in St. Paul, Minnesota. Xcel owns two nuclear power plants, the Monticello Nuclear Generating Plant and the Prairie Island Nuclear Power Plant, although both are currently operated by the Nuclear Management Company, an organization co-owned by Xcel and four other energy companies. On November 19, 1971, a water storage facility at the company's plant near Monticello, Minnesota overflowed, releasing 50,000 U.S. gallons (190 m�) of radioactive waste water into the Mississippi River. Some radioactive substances later entered the downstream St. Paul water system. The Prairie Island plant has been controversial due to the above-ground on-site storage of radioactive waste in large steel casks. This storage is necessary because the United States federal government facility at Yucca Mountain is not yet open (and opposition to the facility is heavy). In 2000, Xcel was one of eight American energy companies to request the opening of a temporary facility in Utah that could store 4,000 casks, but the state's governor Mike Leavitt said he would use all of his power to stop construction and use of such a site. At the time, the Prairie Island facility was limited to storing 17 casks, a limit that has since been increased, although Xcel is required by the Minnesota Legislature to pay the local American Indian tribe $1�2 million each year and explore renewable energy. Xcel customers in Colorado, Minnesota, and New Mexico can purchase wind power through a program known as "Windsource". Customers can elect to pay an extra amount on their monthly utility bills, directing the company to use or purchase more energy from wind farms. This can be done in "blocks" of 100 kilowatt-hours ($2�3 per), or the entire amount of energy can come from wind. As of May 1, 2004, the company had 829 megawatts of generating capacity from wind power spread across five states. This is about 5% of the company's total generating capacity, which is roughly 15,500 megawatts. Several coal-fired generating plants owned by Xcel are being converted to run on natural gas, which produces fewer emissions. Xcel briefly owned the then-financially troubled NRG Energy in the early 2000s, roughly doubling the size of the company in terms of employees and generating capacity. NRG went through bankruptcy and soon became independent again.